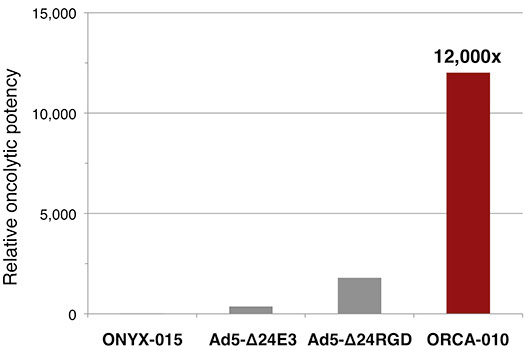 ORCA-010 exhibits superior oncolytic potency across 14 different human cancer cell lines compared to ONYX-015, Ad5-Δ24E3 and Ad5-Δ24RGD. The ability of ORCA-010 to kill cancer cells, the so-called oncolytic potency, was tested in the laboratory on 14 cancer cells lines. These cell lines are derived from solid tumors of different organs including the prostate. The oncolytic potency of ORCA-10 was also compared with that of ONYX-010, Ad5-Δ24E3, and Ad5-Δ24RGD, three earlier generation oncolytic adenoviruses. To this end, the cancer cells were exposed to different concentrations of the viruses. After 2 to 3 weeks, the number of cells remaining viable were determined and dose-response curves were created. The concentration of virus that kills half of the cells under these conditions is called the EC50 and was calculated to compare the potency of the viruses with each other and on different cells.